If you looking to build a professional website without writing a piece of a code, there are many options such as Wordpress, Wix, Weebly, Squarespace etc,. But out of all those platforms, I would highly recommend using Squarespace because it is easy to use, everything is one place, responsive websites, Easy setup and faster and much more. This tutorial is one of the popular tutorials to get started with Squarespace without any programming language. The video tutorial is easy to follow and each tutorial is organized very well that you don't feel difficult to understand the concepts. In this tutorial, the instructor walks you through the functional business website, e-commerce store, and blog. The instructor also shows how to add videos in the background, integrate your website with Stripe, PayPal, USPS, MailChimp to collect the emails using forms and many more. This tutorial is best suitable for the people who want to develop a business website/blog on their own. In order to get familiar with the Squarespace interface, the Squarespace company has released a few videos so that users can learn and build the website/blogs with ease. As part of it, they have updated many videos on their official website. All the content is available for free and you can go through the official help articles and go through the videos provided here. The videos are divided into many sections and you can jump to anywhere as per your requirement. This tutorial is helpful for any proficiency levels. This is a great place to learn about the Squarespace and here you will learn from the scratch. The instructor starts by explaining why Squarespace and then explains about the Squarespace setup, adding pages and content to the website, customization and layout methods, how to work with blog and e-commerce store. Following all the videos, you will be able to build the website up and running without any difficulty. This tutorial gives a comprehensive overview of Squarespace and here the instructor shows you how to edit your profile, site logo, and site title, how to change the template, how to add custom CSS and how to apply Typekit fonts, how to set up pages, and then the instructor shows understanding site navigation, how to edit content: banners, footers, text, images, and more, how to add a gallery block, how to add a blog, how to upgrading your Squarespace plans and how to create the custom domains. etc,. If you're looking to develop an e-commerce store, then this is the best place to start your journey. Here is this tutorial, you will learn how to start your online store from start to finish. Each video tutorial helps to understand a new topic in Squarespace. In the first video, you will learn how to add, design, and organize your product page and also learn different methods of selling and shipping products. In the second video, you will learn how to connect to the different payment methods such as Stripe, Apple Pay, PayPal and how to setup check-out and shipping, and finally, how to send a test order to a customer. In the 3rd video, you will learn about how to set up your shop, sell products, manage orders, and promote your store using social media. In the last video, the instructor discusses the different ways of promoting your website on social media, blogging, and create announcements for your customers. This tutorial gives you the basic overview of how to set up the account and customize your website using the Squarespace platforms. In this tutorial, the instructor shows how to get started with the Squarespace platform, how to create a blog, how to schedule meetings, how to resize the images, how to add social icons, creating landing pages, how to embed a video in the background, how to display the images and many more. This tutorial is best suitable for complete beginners. If you're a web developer and want to earn money by building the websites using Squarespace platform then this is the perfect tutorial for you. The instructor has a good hands-on experience on the Squarespace platform and the instructor not only explains about the Squarespace but she also shares tips and tricks for getting the business side of it going. The instructors' explanations are very clear and concise. The best thing about this tutorial, you will not only learn how to build the websites but you will also learn SEO part as well. Here, in this tutorial, you will learn about the basics, how to create social icons with Canva, and blogging. In this YouTube channel, you will find the 3 playlists for basics, Canva, and blogging topics. In the basic tutorial, you will learn about the basic features of the Squarespace and how to use them for business needs. In the Canva playlist, you will learn about working with Canva for social icons. In the Blogging playlist, you will learn how to set up a blog in the Squarespace and how to create tags and categories, set up the related post content at the bottom of the article. In this video tutorial, you will learn about the actionable information that you can apply immediately and implement on your website. 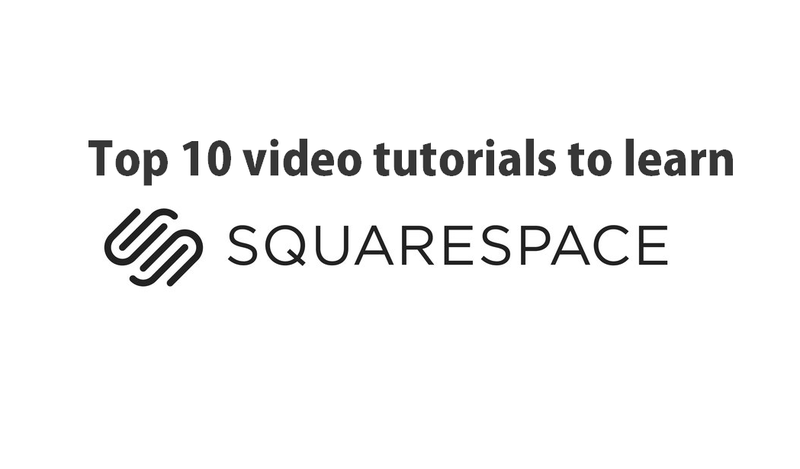 You may find these video tutorials helpful to get started with Squarespace tutorials. For extra support, you can go through answers.squarespace.com and you can find many questions that are posted before and you can take advantage of those answer as a solution for your queries. If you want to learn more, you can join circles in Squarespace. This is a private program that is offered for contributors of Squarespace website designer/developers. The minimum eligibility to join the circle is that you should have to be a contributor to at least 3 Squarespace accounts.